To make the most of the treatments you receive from our fantastic team of health and wellness professionals here at Kinesis Health Associates, what you do when you go home and go about the rest of your day makes a big difference! As school starts, make sure you and your children are packing backpacks well to prevent shoulder and back strain. When packing, make sure the larger, heavier items are near the back so that they are worn close to the body. Pointy or irregular objects should be near the exterior. Total weight of the bag should not exceed 10% body weight. 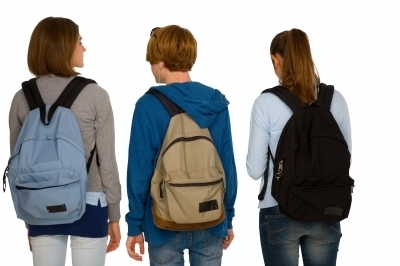 -Avoid wearing your backpack with your back arched or rounded. These are signs that the bag is inadequately adjusted or too heavy. A well-fitted backpack should have wide shoulder straps and a padded or cushioned back. The top of the backpack shouldn’t be higher than your shoulders, but the bottom shouldn’t hang below the top of your hipbone. You should be able to fit your hand between you and your backpack comfortably, but weight should rest evenly on shoulders and hips. Wearing the waist strap can help even out weight distribution, taking some of the stress off of the shoulders and back.